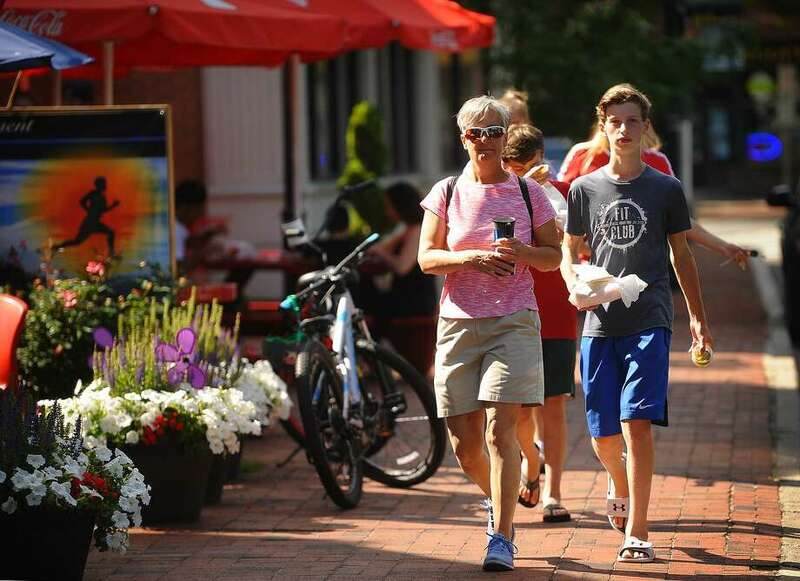 Foot traffic on Reef Road in downtown Fairfield on Monday. Genesis Sanchez, a New York resident and student at Fairfield University, has been awarded a Norman Woodberry Scholarship by the World Affairs Forum in the amount of $3,100 to study in Gambia for the summer. Sanchez completed her sophomore year in pursuit of a bachelor’s degree in educational studies and sociology, and is looking to take what she has learned in the classroom and pursue her passion through an immersive experience abroad. Over the next few months, she will intern at Starfish International, a school designed to empower women in a village of Gambia. “Being able to immerse myself and see how a different society lives from a firsthand experience will feed my passion for learning. Studying abroad will build upon the theoretical foundations I’ve gained in my educational studies and sociology courses. My choice to study in Gambia will combine my three loves: teaching, sociology and the exploration of culture,” Sanchez said. The World Affairs Forum, a nonprofit community organization, established this scholarship program to encourage deserving university students interested in pursuing an international career to study abroad. Students who are residents of or attending college in Fairfield County or Westchester County, N.Y., are eligible. For information on scholarships, visit worldaffairsforum.org. In early June, employees from ESPN teamed up with Fairfield-based Save the Children to help kids in need by assembling learning kits. The Kits for Kids event on ESPN’s campus in Bristol brought together dozens of volunteers who packed 1,500 tote bags with supplies aimed at encouraging children to learn, play and grow. Kits assembled by Team ESPN, called Early Steps to School Success Kits, include books such as “Big Red Barn” and “Don’t Let the Pigeon Drive the Bus,” along with educational toys. Early Steps to School Success is a Save the Children program that delivers early childhood development services to children and their families in 14 states. The program equips parents with the skills to successfully support their children’s growth. Save the Children will deliver these kits to vulnerable children in the United States, including children growing up in poverty-stricken pockets of rural America. A report released by the global humanitarian organization last week, “Growing Up Rural in America,” found one in four children in America’s rural areas live in poverty, compared to one in five who live in urban areas. The hands-on event was one of several Kits for Kids projects during the Global Week of Service with Disney, ESPN’s parent company, to benefit Save the Children. Nearly 20,000 kits are being assembled by Disney employees in the U.S. and around the world. Grace Holmberg and Quinn Igram, both of Fairfield, were named to the Gettysburg College dean’s list for the spring semester. Gettysburg named Fairfield residents Aren Heitmann, Caliope Kaiser, Tatum Lareau, Mark Malone, Annie McNamara and Kerry Ullman to the dean’s commendation list. Fairfield residents Richard Guinta and Philip Nesbitt were named to the dean’s list at Azusa Pacific University for the spring semester. Jason Marcello , of Fairfield, was named to the president’s list at Southern Vermont College for the spring semester. State University of New York at Potsdam athlete Luke Vitale , of Fairfield, was named to the SUNYAC Commissioner’s academic honor roll for the 2017-18 season. Springfield College named Fairfield residents Bryan Davis and Daniel Sanfilippo to the spring semester dean’s list. Charles Kane , of Fairfield, was named to the Hofstra University dean’s list for the spring semester. Fairfield residents Rachel Wolfeiler, Austin Sherman, Sarah Roussel, Gabriella Petrone, Aidan Myers, Jane Mafale and Samantha de Lannoy were named to the spring dean’s list at Muhlenberg College. Anne Marie Moeder and Lauren Claire Hilliker, both of Fairfield, were named to Clemson University’s president’s list. Michael Adams, Meghana Damaraju, Emily Kirsch and Taylor Westermann , all of Fairfield, graduated from Union College on June 17. Amanda Nicole Bow, James Bartholf Surrick, Victoria Faye Godfred and Lauren Elizabeth Jacobi , all of Fairfield, graduated from James Madison University on May 4. Fairfield residents Jake Kiremidjian, Thomas Luckner and Michael DePinto, all of Fairfield, graduated from Eastern Connecticut State University on May 15. Fairfield residents Casey Palmer, Amy Jo Sheketoff and Taylor Sapia recently graduated from Springfield College. Brendan Cassidy and Max Martel, both of Fairfield, recently graduated from Western New England University. Julia Campbell, of Fairfield, earned a bachelor’s degree in psychology from the Georgia Institute of Technology in Atlanta in May. Lily Nevins-Perle, of Fairfield, graduated from the Rochester Institute of Technology with a bachelor’s in photographic and imaging arts in May.